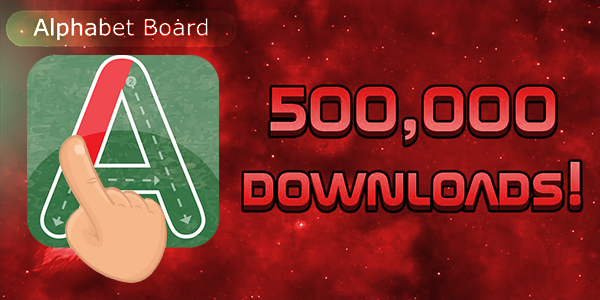 >> 500,000 Downloads for My Course Game “Alphabet Board”! ​As a freelance games developer reaching this number is a great milestone, especially if your idea is original and you worked hard to achieve it, I’ve got 500,000 downloads for my Alphabet board game​ on the Google playstore only, made over $20,000 From this game only in 2015, I’ve got the game published as a complete asset on the unity asset store, and iOS store also, but how have I created such a game from scratch?​ If you want to know more you can enrol in my Unity Alphabet Board Step by Step Course​ from here​ for only $25, if you want to learn more on how to create fully Integrated In app purchase inside the game, you can register in my Unity In App Purchase Complete Course​ from here​ for only $10, If you want to go to the next level and master how to add ads and monetize and promote your game, I recommend my Unity Professional Development From A to Z Course for $10 only​. These courses that I’ve worked hard to be real and live here on Udemy, just take this chance and earn thousands of dollars every month by learning all these real life skills from a real 2d games developer.